Phil Robertson has made himself a name in the news in recent months mostly because of his outspoken views on some very hot topics. He has also become well known as the family leader in the popular American reality television show “Duck Dynasty” which first aired on cable station A & E in spring 2012. Phil’s popular show has drawn in a reported more than 11 million viewers and over $80 million of advertising in just the first 8 months of 2013. And don’t forget the more than $400 million in revenue that was produced by merchandise sales . Phil Roberston has gone from rags to riches in his family business (Duck Commander) as well as “Duck Dynasty”. Since the mid 70’s Phil has been living for the Lord and it is no secret that he believes that it is “The Almighty” that has brought him such success. He regularly speaks to churches and other organizations telling them what the Lord has done for him and what He can do for them . Sometimes it is fun to look at some of the things such a popular character has said. Here are just 15 of what I consider to be top Phil Robertson Christian quotes. “Our founding fathers started this country and built it on God and His Word, and this country sure would be a better place to live and raise our children if we still followed their ideals and beliefs. Speaking out for what we believe is not always easy. But God promises to give us the right words when we are prepared to give an answer (1 Peter 3:15). 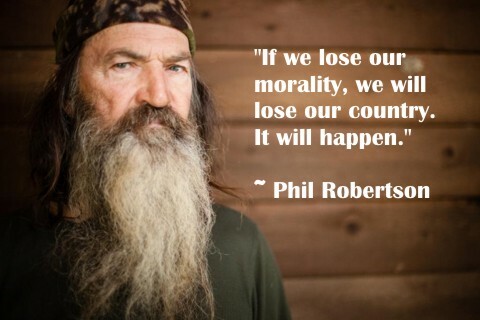 Phil Robertson sometimes says things that are rough around the edges but I must give him credit, at least he is speaking out for what he believes is right. Can we say the same about ourselves? More reading: Can a Person be Born a Homosexual? I love this guy. I hope I can stand for Jesus as faithfully as he does.